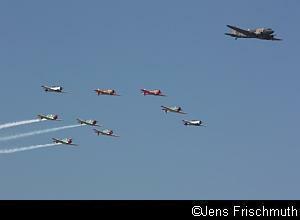 The 2010 Swartkop Airshow was held at Air Force Base Swartkop outside Pretoria on the 14th of August in front of a huge crowd of more than 50 000 spectators. This year's theme was "90 Years on Golden Wings" as the day formed part of the 90th anniversary celebrations of the South African Air Force (SAAF), which was established in 1920. Other historical events that were celebrated were the 75th anniversary of the Douglas DC-3 Dakota (which first flew in 1935), the 60th anniversary of the first delivery of the De Havilland Vampire (the first jet fighter flown by the SAAF) to the air force in January 1950, the 50th anniversary of the delivery of the Alouette II to the SAAF and the 60th anniversary since the SAAF's 2 Squadron Flying Cheetahs left for Korea. Proceedings on the day started with the opening parade in which all the emergency vehicles participated, a display by motor gliders, a skydiving display by the Golden Eagles (the elite parachute display team of the SAAF) and a solo display by a CASA 212 light transport plane. 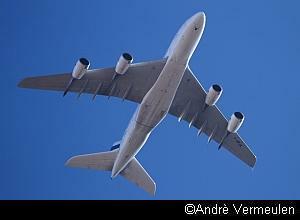 Before the air displays started in earnest, the crowd was treated to the fly-over of an Air France Airbus A-380 Super Jumbo, whose run-in into OR Tambo International Airport was diverted so that the jet could make a surprise appearance over Air Force Base Swartkop. The Gripen, South Africa's current air superiority fighter, was demonstrated in the capable hands of Lt. Col. Charl Coetzee. 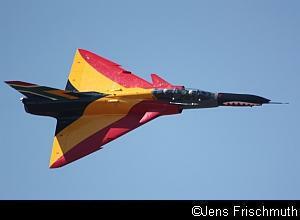 This was the first air show appearance of a South African single-seat Gripen C. The display plane was Gripen 3914, and serial no. 3915 was on static display during the event. 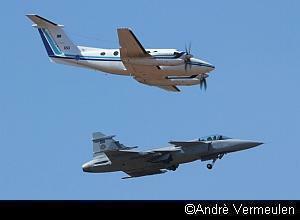 These two are the newest two of six single-seaters (Gripen Cs) that have been delivered so far. The first nine Gripen fighters delivered were the two-seater version (Gripen D) and a further 11 single-seaters are still to arrive to fulfil the total order of 26 planes (9 two-seaters and 17 single-seaters). The Gripen should have flown a formation display with the De Havilland Vampire (a formation display of the newest and the oldest jets in the air force). However, the Vampire developed a problem after the pilot was strapped into the plane already and would not fly again during the air show. 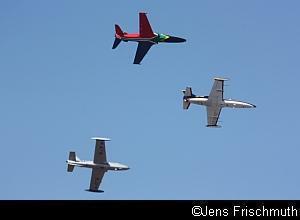 An interesting formation display consisted of an Impala Mk1, a L-39 and a BAE Hawk. Mike Weingartz in the Impala took off in formation with Pierre Gouws in the L-39 from Swartkop and they linked up with the Hawk, which was operated out of AFB Waterkloof. After the three jets performed various formation passes, the Hawk performed a solo routine before returning to Waterkloof. The museum's Mirage IIICZ, flown by Lt. Col. Glen Warden, is always a hugely popular airshow attraction. 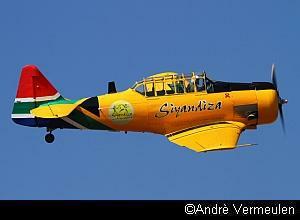 Based at AFB Hoedspruit, this plane was kept at AFB Waterkloof for the duration of the airshow and operated from there. Glen flew two full displays during the day that included touch-and-goes, high-speed passes and lots of fast paced action. The Mirage also participated in the late afternoon Thunder Formation (see below). Another morning highlight was a mass radial formation flypast that consisted of nine North American AT-6 Harvards and the museum's Douglas C-47 Dakota. The Harvards subsequently did their Tora Tora Tora display where they flew behind each other and swooped on the airfield one at a time to simulate a ground attack. This was followed by a display of the Dakota and then the four Harvards of the Flying Lions, who participated in the mass radial flypast, flew their morning display. One of the day's highlights was the appearance of a Denel Cheetah D. This was the first time that a Cheetah was seen at an air show since they were withdrawn from service in March 2008. The display aircraft, serial 861, is one of two kept flying by Denel Aviation as test beds, the others having been placed in storage. Although initially scheduled to perform a fly-past, the crowd was treated to a full display that included a touch-and-go in the capable hands of Mike Weingartz, who is a Denel Aviation test pilot and a highly experienced air show performer. During the day, the museum put on two helicopter formation displays with an Aerospatiale Alouette II, Alouette III and Puma. 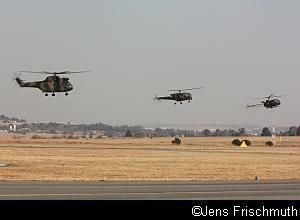 The formation was referred to as the "Generals Formation" as Major General Hugh Payne, Brigadier General Sakkie van Zyl and Brigadier General John Church flew the three helicopters respectively. After the formation routine, each helicopter was put through its paces on its own. Other museum aircraft to fly on the day were the Piaggio Albatross, Atlas Kudu, Siyandiza Harvard, Aermacchi Bosbok, as well as the Douglas C-47 Dakota that took part in the mass radial display with the Harvards. Civilian displays consisted of a Tiger Moth owned and flown by Col. Jeff Earle, the Sukhoi Su-29 piloted by Warren Haslam, the Mazda Zoom Zoom Extra 300 flown by Brad Bennetts and the Gabriel Wings Aerobatic Team of Scully Levin, Ellis Levin, Arnie Meneghelli and Stew Lithgow in their Pitts Specials. Also of great interest was a simulated Air Intercept Mission similar to the ones that the SAAF performed during the recent FIFA Soccer World Cup held during June and July in South Africa. The Air Force was responsible for securing the air space during the event and was tasked to intercept all aircraft that strayed into sterile airspace. In this case, the "suspicious aircraft" was a King Air, which was intercepted by a Gripen and escorted to the runway and forced to landing at Swartkop. As soon as the plane was on the ground, rapid response troops were dropped off at the scene by a C-130 Hercules and two Oryx helicopters. Soon, the suspicious plane was surrounded by the troops so that the threat could be neutralised and the plane stormed if necessary. Ambulances and fire trucks stood by in case their services should be required at any time. Once the situation was diffused, the troops were whisked off in the Oryxes again. Further routines flown by the air force included a dual display of an Oryx and an Agusta 109 helicopter and a solo display of a Cessna Caravan. 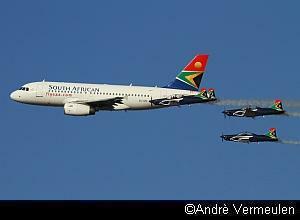 In the afternoon, the Silver Falcons performed a superb formation fly-past with a South African Airways Airbus A-319. After the fly-past, the formation approached the spectators from the front and performed a formation break in front of the crowd. 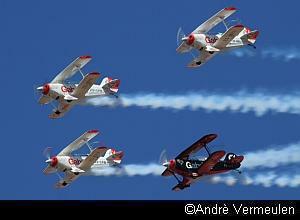 Thereafter, the Silver Falcons went into a holding pattern so that the Airbus, flown by Capt. Johnny Woods and Capt. 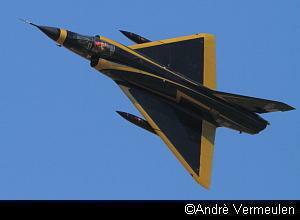 Pierre Gouws, could do its solo display. 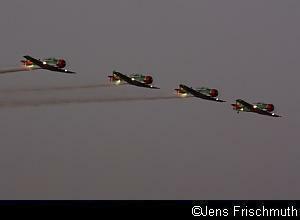 The Silver Falcons display took place as soon as the A-319 had cleared the display box. For the team consisting of Maj. Scott Ternent, Capt. Roy Sproul, Capt. Buti Tsebe, Capt. Gerhard Lourens and Maj. Nico Frylinck, this was their second display of the day, as they had flown in the morning as well. 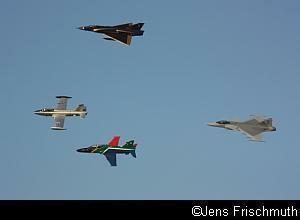 The Thunder Formation, consisting of the Mirage III, Impala, Hawk and Gripen thrilled spectators in the late afternoon. This unique formation flew a few circuits before it split up and each individual jet performed a brief individual display and fly-past. 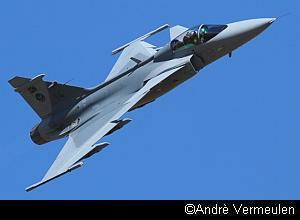 The Gripen filled in for the Vampire that had gone unserviceable earlier during the day. As the Gripen had to perform a solo display right after the Thunder Formation, it landed and was hot refuelled in a few minutes. This offered everyone the opportunity to see the quick turn-around times that are possible with this plane. The air show ended with a Twilight Show by the Flying Lions in their Harvards. Equipped with tractor lights that shine into the plane's exhausts, the visual effects of this act are always very impressive. This was a fitting end to a very well attended and successful event. Credit goes to the staff of the SAAF Museum who made this event possible. On a personal note, we would like to thank Maj. Ronel Prinsloo and also Lt. Martin Matsetse for looking after us.